Profiles of the five men featured in this report, plus the Web-exclusive story of a sixth, Dennis Fritz. The exonerated talk about their newfound freedom -- and the scars left by years of unjust imprisonment. Why don't exonerees get state assistance? How can I help? Plus, state-by-state info on legislation, and more. Photos and excerpts from photographer Taryn Simon's new book about 45 men falsely accused and convicted. Funding for FRONTLINE is provided through the support of PBS viewers. 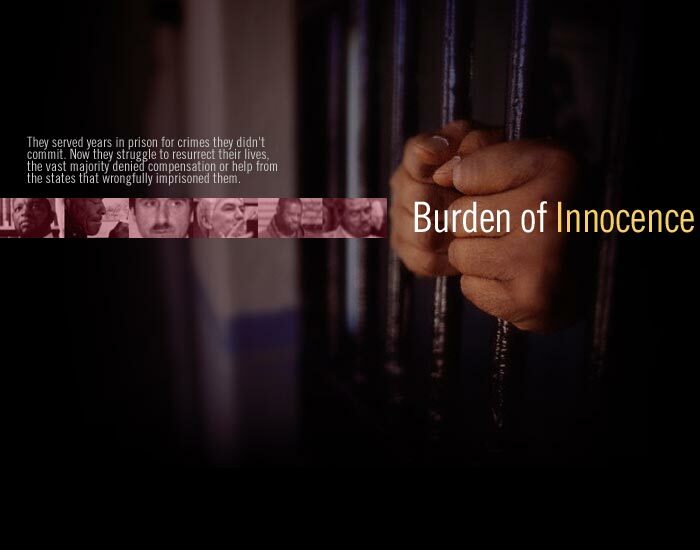 Additional funding for "Burden of Innocence" is provided by a grant from The After-Prison Initiative of the Open Society Institute. In recent years, media headlines have trumpeted the release of more than 100 longtime inmates who have been exonerated by DNA testing. But what happens to these wrongly accused inmates after the media spotlight turns elsewhere and they must attempt to rejoin a world far different from the one they left behind? In a new one-hour documentary, FRONTLINE producer Ofra Bikel examines the many social, psychological, and economic challenges facing exonerated inmates, the vast majority of whom must re-enter society with no financial or transitional assistance whatsoever. The film highlights the cases of several recently exonerated inmates and the hurdles they face as they attempt to repair the damaged inflicted upon their lives. It also examines efforts to pass laws that would allow the wrongfully convicted to sue the government for compensation.